Last Monday, flights between Minsk and Moscow suddenly stopped. Russia has recalled the licence for flights to Russia from Belavia, the Belarusian national airline. The Belarusian side responded by cancelling the licences of the Russian companies. A new trade war between Belarus and Russia is brewing. Although the flights have resumed according to the temporary agreement, the conflict yet again reveals the tough methods Russia employs to promote its economic interests in Belarus. As Belarus's conflict with the West escalates, Lukashenka feels unsafe on the Eastern front where Moscow is taking advantage of his weakness. However, this and other trade wars do not mean that Russia will decide to "civilise" the Belarusian ruler any time soon. A weak and isolated Belarus is an easy prey for Russian economic advances. At the moment, the frequency of flights operated by the Belarusian and Russian air companies between two capitals is regulated on parity basis, four flights a day from each side. However, only slightly more than a half of the seats these flights are filled, which makes them unprofitable. 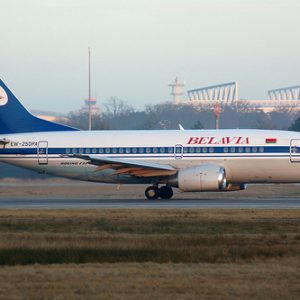 Increasing the frequency of flights would certainly bring losses to Belavia. The Russian side is apparently eager to return the situation of the Soviet times when the Belarusians flew into the world through Moscow. The Russian companies know that Belavia provides expensive fares and is not good at marketing its flights. It relies on Belarusian government support and effectively acts as a monopolist on the Belarusian market. The Russian companies are willing to conquer the new market by proposing cheaper tickets for Belarusians flying abroad via Moscow. However, at the moment they are constrained by the frequency of flights. Once this barrier is removed, they will be able to overtake the market and effectively drive Belavia into insolvency. The new trade war demonstrates that Lukashenka is not prepared to give up any assets to Russia, and even the confrontation with the West cannot change his mind. Lukashenka does not prefer Russia to Europe, and his conflicts with the outside world stem from pragmatic interests free of any ideology. The current "airlines war" is neither the biggest nor the most important trade war. The disputes over the exports of Belarusian goods to Russia and the transit of Russian gas and oil made many headlines across the world in the 2000s and were much more serious. There were also conflicts related to the export of agricultural products. The trade wars with Russia are much more dangerous to his regime than all its troubles with the West. The nightmare of Russia closing borders to Belarus exports constantly haunts the Belarusian ruler. Last month, Moscow threatened to stop the Belarusian milk exports to Russia. This is not the first in the series of "milk wars". The Russian businesses have been eyeing the Belarusian dairy industry for a long time, and Lukashenka signed the first agreement on selling dairy branch enterprises to Russians in 2008. But as with many other agreements, he was in no hurry to deliver. A little milk war waged by Moscow the same year made him sell just one enterprise. The next conflict, in June 2009, was the biggest of all. Then, the Belarusian ruler publicly declared that Russia wants to take over the Belarusian dairy production. However, he lost the dispute and had to concede one more dairy fabric to Russia. Another milk war took place in 2010. Belarus has also lost several sugar wars to Russia. In 2005, Russia accused Belarus of "dumping" by selling cheap sugar made from the Cuban sugar cane. Moscow emphasised that the agreements on the Belarusian sugar exports applied only to the sugar products made of the local beets. The low-intensity dispute lasted for two years until in 2007 Belarus had to cut its exports. It was painful, as Belarus had taken up to 10 per cent of Russian sugar market by that time. Just in November 2011, the Belarusian ruler promised that "[a]fter establishment of the Single Economic Space milk, sugar and other trade wars [would] disappear.” The Customs Union between the two countries already prohibits trade barriers. However, the agreements between the post-Soviet nations tend to be less stable than similar agreements among the Western countries. This is why trade wars in this region are such a frequent occurrence: nobody trusts the letter of the law. Instead of resorting to courts or arbitration, the governments and corporations in the post-Soviet space tend to use whatever coercion tools they have: they turn off gas, shut down borders, etc. Political analyst Alyaksandar Klaskouski has warned that Putin could "take Lukashenka by the throat demanding implementation of integration projects" that would begin with the creation of the single economic space and culminate in the establishment of the Eurasian Union. The Belarusian regime will be forced to open borders and undertake economic reforms, particularly in the wake of Russia's accession to the WTO. Past trade wars between Russia and its neighbours prove that the sources of such conflicts lie beyond pure business interests. They are primarily linked to the political ambitions of the Russian government. This became obvious after Moscow initiated multiple conflicts with the post-Soviet nations over gas, banned Georgian wines, Latvian fish, and Ukrainian cheese. Just some days ago, in order to exert pressure on Baku as a Russian radar station on its territory is being negotiated, Russia threatened to restrict Azerbaijani exports of vegetables and fruits. The Belavia affair is just one instance of the increasing danger to the future of Belarus as an economically viable nation. The country's relations with Russia are far less rosy than Lukashenka presents them. The Russian rulers and businesses are aware of Lukashenka's vulnerabilities. In conflict with the West, Lukashenka is all the more dependent on Russia. Lukashenka's troublesome relations with Moscow do not mean that Russia has finally decided to civilise the dictator. The Russian leadership merely wants to strengthen their control over the Belarus leader and are not going to change the absolutist features of his regime or stop his persecution of the opposition. On the contrary, the more political prisoners Lukashenka holds, the better for Moscow. They make Russia look more democratic in the eyes of the West. They also increase Belarus' dependence on Moscow – as the democratic Western governments become even more reluctant to deal with his regime. This rule works not only for Belarus, but also for other autocratic regimes across the world – from Syria to Uzbekistan. The flaring diplomatic breakdown between Belarus and the EU and closer ties with Russia have dominated Western press coverage over the last month. Analysts offer mixed views about the significance of the row for the geopolitical balance between the three parties. The Economist argues that the EU strategy is not working. It reports on the EU’s enduring inability to build a common foreign policy, and the internal blocks to decisive action towards Minsk: the Union even difficulty in agreeing on the list of people on whom to impose the travel ban. It reports that many in Belarus continue their call for increased support for civil society from the EU in lieu of confrontation. Freedom House’s David Kramer and the Fund for Belarus Democracy’s Joerg Forbrig have published their prescribed plan of action for the EU vis-á-vis Belarus on euobserver.com: make the return of diplomats contingent upon release of all political prisoners; expand the visa ban list to include those associated with the trial and execution of the metro bomb suspects; and ban Belarusian companies associated with the regime from operating in the EU. … and All’s Well with Russia? The Economist highlights the implications of Lukashenka’s decision to rely upon Russian support at the expense of diplomatic relations with the EU. Despite making the usual proclamations of solidarity with their Belarusian neighbours, the Russian government’s own increasing political instability means that the cover it has traditionally provided to Lukashenka may finite. The Financial Times suggests that Lukashenka’s hardball response to the introduction of fresh EU sanctions was only made possible by his current proximity to Russia following the bail-out granted by Moscow last year. However, it warns that Russia’s advance can only prop up the regime for so long, as economic growth is once again in decline. Lukashenka’s decision to engage in an accelerated breakdown in relations with the EU may come to hamper the prospects of a bailout from the IMF, according to Lilit Gevorgyan of IHS Global Insight. 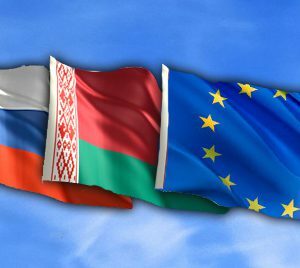 Writing on the Eastern Partnership web-site, Chair of the EuroBelarus consortium Ulad Vialichka suggests that it is possible that picking a row with the West may have been one of the conditions of the Russian loan to Belarus. He warns, however, that the power struggle is far from over, and much remains to be done before Russia can secure its longed-for Eurasian Union and assert fully the kind of control which it desires over Belarus. He describes the current Brussels strategy as “optimal”: the synchronised withdrawal of ambassadors has sent out a clear, unified message. The execution of the two men condemned for the Minsk metro bombings in April 2011 received significant coverage in mainstream Western media. The Toronto Star and the New York Times both pointed to the suspicious context of the bombings and flawed trial of the condemned men. Condemnation of the executions from the EU and Council of Europe was widespread. The Washington Post has described the events of 25 March, at which 2000 people held a sanctioned rally to mark the anniversary of the inception of the short-lived Belarus National Republic (BNR) of 1918, as the largest anti-government protest since the presidential elections in 2010. Big Pond News reports that the protesters called for Belarus to become a European-style democracy. While the Washington Post seems to overlook the Freedom Day context of the rally, Radio Free Europe provides more perspective on the events. It outlines that the opposition’s chief call was that this historically significant occasion be given proper acknowledgement by the state. Writing on the Jamestown Foundation’s Eurasian Daily Monitor, David Marples considers the dilemma facing the opposition as they decide whether to boycott or mobilise ahead of September’s parliamentary elections. In the context of the 25 March Freedom Day march, the question of whether to recognise the Belarus National Republic as a government-in-exile has been revived. Marples suggests that fertile ground exists for the opposition to unite and engage with the many disillusioned Belarusian voters ahead of the election; attention should not be diverted to this government-in-exile question so long as avenues for change from within the country have not been exhausted. The BBC and Radio Free Europe report that Reporters Without Borders have added Belarus to their annual list of “enemies of the internet”. This follows an increase in the number of blocked websites and arrests of bloggers. It also reports that the authorities have used Twitter to send intimidating messages to protesters. The New Statesman has published a damning critique of Wikileaks’ Julian Assange’s associations with the Belarusian authorities. It reports that one of his associates severely endangered dissidents within Belarus by providing Lukashenka with leaked evidence of which opposition activists were being funded by the US. Controversially, Assange was invited to chair Q and A at the recent premiere of documentary Europe’s Last Dictator in London. The Belarus Free Theatre continues to get high-profile coverage in the Western press. Euobserver.com reports on the flourishing of underground culture in Minsk and the theatre’s defiance in the face of the authorities. The UK’s Guardian and Independent newspapers have drawn attention to the Free Theatre’s funding crisis. The Independent reports that the troupe arrived in London this month for their first-ever Shakespeare performance, in Belarusian, “a language that is banned in Europe's last dictatorship”.